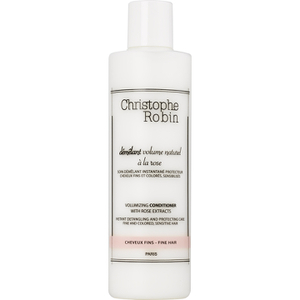 Gently cleanse your hair, whilst improving color vibrancy, volume and softness with Christophe Robin Delicate Volumizing Shampoo With Rose Extracts (400ml). Enriched with rose water and baobab leaf extract, it has a gel formula that nourishes and strengthens your hair, whilst the antioxidant ingredients and acid pH prevent pigment loss to keep your hair looking vibrant and lustrous. - L.M. Aqua (Water), Sodium Lauroyl Sarcosinate, Cocamidopropyl Betaine, Glycerin, Acrylates Copolymer, Disodium Cocoamphodiacetate, Hydrolyzed Adansonia Digitata Extract, Rosa Centifolia Water Extract, Rosa Moschata Seed Oil, Rosa Gallica Extract, Polyquaternium-16, Xanthan Gum, Peg-150 Distearate, Guar Hydroxypropyltrimonium Chloride, Deceth-7, Peg-40 Hydrogenated Castor Oil, Citric Acid, Parfum (Fragrance), Ppg-26-Buteth-26, Sodium Hydroxide, Sodium Chloride, Disodium Edta, Phenoxyethanol, Citronellol, Geraniol, Carbomer, Potassium Sorbate, Sodium Benzoate, Benzyl Alcohol.